The first MADAGASCAR (2005) saw Marty the Zebra (Chris Rock) glumly ticking off his days in captivity at Central Park Zoo. A spontaneous birthday breakout eventually gets him shipwrecked on the titular island along with fellow ex-exhibits Alex the Lion (Ben Stiller), Gloria the Hippopotamus (Jada Pinkett Smith), and Melman the Giraffe (David Schwimmer). There, the “New York Giants” befriend a tribe of eccentric lemurs and dodge bloodthirsty fossa cats while awaiting help from a quartet of military-minded penguins and two brainy chimps. In MADAGASCAR: ESCAPE 2 AFRICA (2008) Alex meets his biological parents, fights a bully, and ends a drought in the pride lands surrounding Mount Kilimanjaro. Alex and Marty put aside past differences as the penguins and chimps cooperate to repair their battered airplane. Hypochondriac Melman becomes a doctor and professes his love for Gloria while Mort the Lemur (Andy Richter) dodges sharks. Dream Works’ new MADAGASCAR 3: EUROPE’S MOST WANTED wastes no time bringing the story full circle. The 3-D adventure begins with another dream sequence, only now it’s Alex tallying the time in exile. In an interesting flip-flop, Alex’s sole birthday wish is to return home to the very zoo Marty couldn’t wait to leave. Ah, but travel arrangements never quite pan out when your pilot is a penguin and your mechanic is a monkey dressed like the King of Versailles. Our hirsute heroes stowaway (not shown) and scuba-swim to Monaco, where their casino chaos draws the attention of uptight animal control officer Chantel Dubois (Frances McDormand). Remember the female robot from TERMINATOR 3? Captain Dubois is just as invulnerable (and trigger-happy) as Kristanna Loken’s cool killer. And she needs a lion’s head for her trophy room. Hilarious high jinks ensue in Monte Carlo when the penguins rescue Alex and company in a “luxury urban assault vehicle” and flee poofy-haired villainess, who makes a dramatic jailbreak of her own. With the authorities hot on their hooves, the animals join (and later purchase) a failing circus. Alex coaches knife-throwing, hoop-jumping Russian tiger Vitaly (Bryan Cranston) with a confidence problem and literally falls for Gia, a jaguar trapeze artist (Jessica Chastain). Gloria teaches Melman to walk a tightrope, where the high-wire waltzes become a metaphor for their delicate interspecies romance. Smarmy lemur King Julian (Sacha Baron Cohen) goes gaga for a bike-riding bear in a tutu (who practically steals the show without uttering a word). But no one is happier with circus life than Marty, who paints himself with polka dots, wears a rainbow Afro wig, and partners with optimistic Italian sea lion Stefano (Martin Short) for a human—er, zebra—cannonball act. Together, the animals work to revitalize their show and convince an American promoter to bring them back to New York. Hop-scotching from London to Rome on the Zaragoza Circus train provides adequate cover from everyone but determined Dubois—who leaps from rooftops, swims with aquatic cobras, and trashes motor scooters across several continents in pursuit of the Cirque du Soleil-Gone-Wild-Kingdom. Do Alex, Marty, Gloria, and Melman ever reach the Big Apple? We’re not telling. Suffice to say the fur-raising climax boasts balloons, neon, tranquilizer darts, and little dogs on jet-powered roller skates. It’s also an emotionally pleasing denouement for those invested in the animals’ wacky three-part journey. Franchise director Eric Darnell delivers what may be his best cartoon movie yet, and co-writer Noah Bombach (who penned the wonderfully idiosyncratic FANTASTIC MR. FOX and THE LIFE AQUATIC WITH STEVE ZISSOU for Wes Anderson) outdoes himself with a script that’ll leave kids in stitches without ostracizing parents. Indeed, the picture’s cerebral, well-timed jokes and visual gags drew uproars from the grownups at the screening we attended. Inveterate kid-movie producer Tom McGrath (who voices Skipper the Penguin) also deserves praise for his creative input on this satisfying series. Hans Zimmer (GLADIATOR, THE DARK KNIGHT) returns with another snappy soundtrack. The composer even recycles Charles Dumont’s operatic “Non Je Ne Regrette Rien (I Have No Regrets)” in a funny hospital sequence; the tune played a pivotal role in 2010’s Zimmer-scored dream caper INCEPTION. 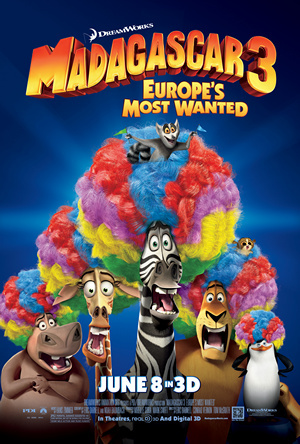 MADAGASCAR 3 also features popular tunes by Katy Perry, Journey, Nelly, and C + C Music Factory—often in humorous bits with party-loving King Julien. But it’s Marty’s own infectious “Afro Circus” chant that’ll have kids singing on the car ride home. 3 stars out of 4. Wondering who did the old folks song for Madagascar 3?? Check them out right here!